Traditional German sausage recipes don't sound healthy. However, you can control what is in them - the amount of fat and filler. 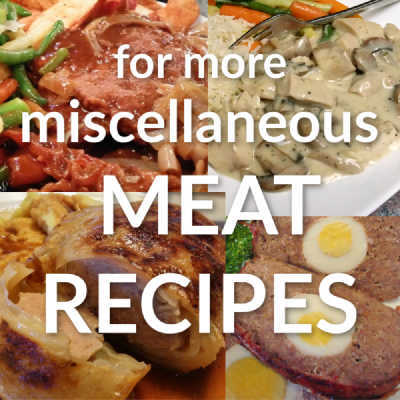 Then, you can enjoy the great taste of delicious sausages as part of your healthy quick recipes collection. Make sure to keep reading below the recipe for more information. If you purchased German sausages, then you'll want to check out how to cook those Bratwurst. However, if you'd rather make your own sausage, here's a recipe for sausage patties that's easy. Mix all ingredients together WELL! Literally knead the meat to distribute the spices. Cover airtight and refrigerate for about 6 hours (OR use right away - I usually do 'cause I can't wait!). Divide into 12 sections and form into patties. Pan fry over medium heat, about 5 minutes per side, until cooked. If your patties are fairly thick, you need to cook them longer - covering them for some of the time will make them cook quicker. Other spices to try are: marjoram, cayenne pepper, nutmeg, allspice. Experiment and have fun! This is how you can change these into different German Sausage Recipes - only available at your house! To pre-taste the meat before frying, make a small ½" - 1" "meatball" and cook on "HI" in the microwave for about ½ - 1 minutes, until done. Although the texture will be tough, you will be able to check the seasonings and if you need to alter any. For the rolled oats, you can use either quick or old-fashioned (which are healthier). You can also increase the amount to 1 cup, but then increase the water to ½ cup. 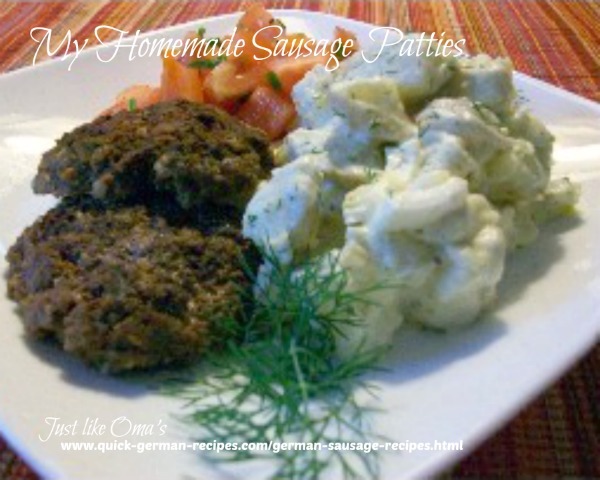 Sausage patties are just hamburger patties, made slightly different, with different spices. If you can make hamburger patties, you can make sausage patties. When you mix the meat - literally knead it to mix the spices and give the sausage texture. (Different than making hamburgers, which are gently mixed). If at all possible, let mixture stand for about 6 hours for the spices to fully flavour the meat. However, I've been in a hurry and BBQ'd them right away. I don't stuff these inside of casings. Did you know casings are made from either pork or cow intestines or from plastic? So, I just make these as patties, since it's faster as well. "To acquire wisdom is to love oneself; people who cherish understanding will prosper."